In the News / What's New? 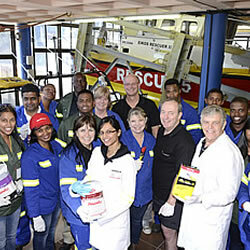 NCP Alcohols staff spent their symbolic 67 Minutes of Community Service painting doors at the National Sea Rescue Institute's (NSRI) Station 5. NCP Alcohols is a proud Silver Partner of their WaterWise Academy which teaches young children water safety to prevent drowning tragedies. The NCP ready for some paint action!